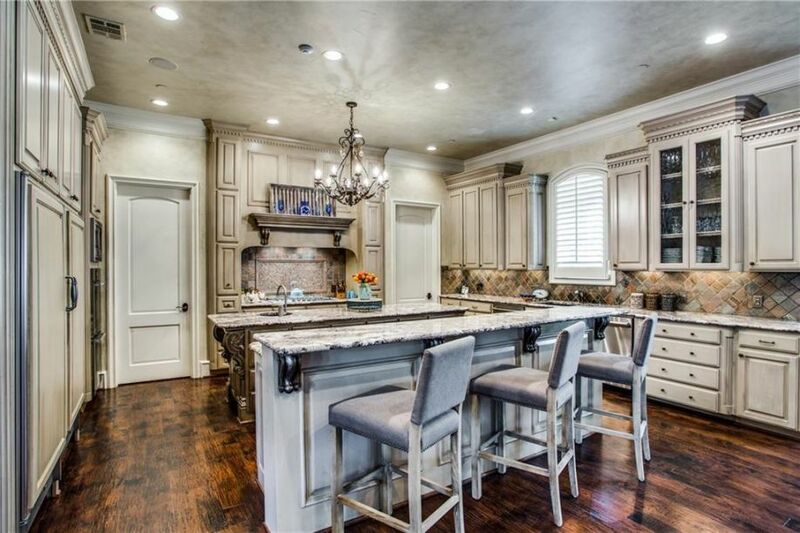 I find that kitchen color schemes are one of those things that can date a home very quickly. If you use the right kitchen paint ideas, you won't notice slightly outdated cabinetry or appliances because the space will still have a fresh and contemporary feel. I think that our home could certainly use a facelift in the wall paint department. 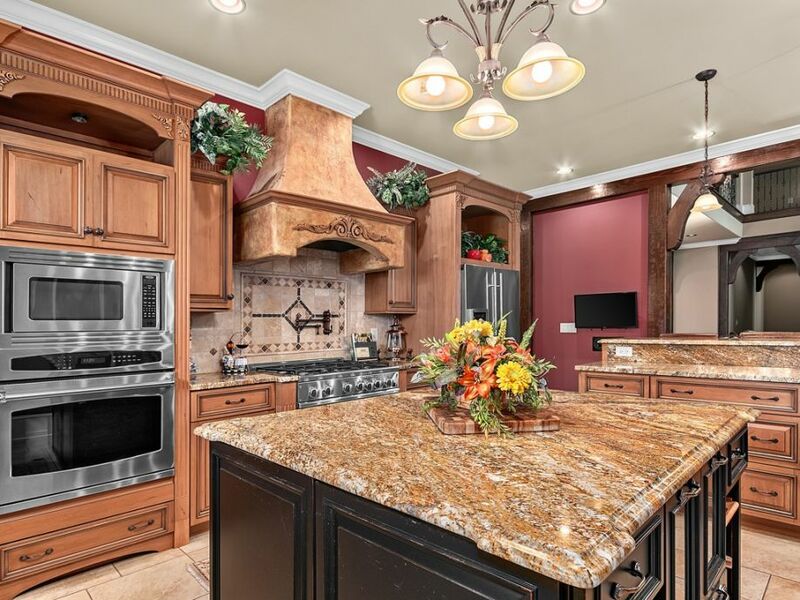 The kitchen has beautiful cabinets, a nice center island, and great granite countertops but the Burgundy shade on the walls make the space seem old and drab. I want to figure out some popular kitchen colors 2019 that would liven up the space a bit and breathe new life into our tired decor. Kitchen color schemes are actually one of the first thing that potential buyers see when they enter the room. You can incorporate all of the cool kitchen ideas that you want, but the eyes immediately go to cabinet finishes, and wall paint. For this reason, especially if you are preparing to list your home, it is imperative that you ensure that your space captures the right kind of attention when you walk in the door (especially since kitchens sell homes). I generally recommend choosing neutral kitchen cabinet colors that provide a nice backdrop to any decor style you think you may want to use later or that buyers would be attracted to. Kitchen color schemes can be tricky because there are so many elements that go into a single design. You have kitchen cabinets, countertops, light fixtures, hardware, appliances, window treatments, artwork, and the list goes on. It is important that the underlying color palette that you decide on blends well with both the decor theme as well as any key architectural details that are in the space. For example, in this rustic yet contemporary home, the exposed wood beam ceiling details are a great design feature but also limit the colors you can use throughout the space. 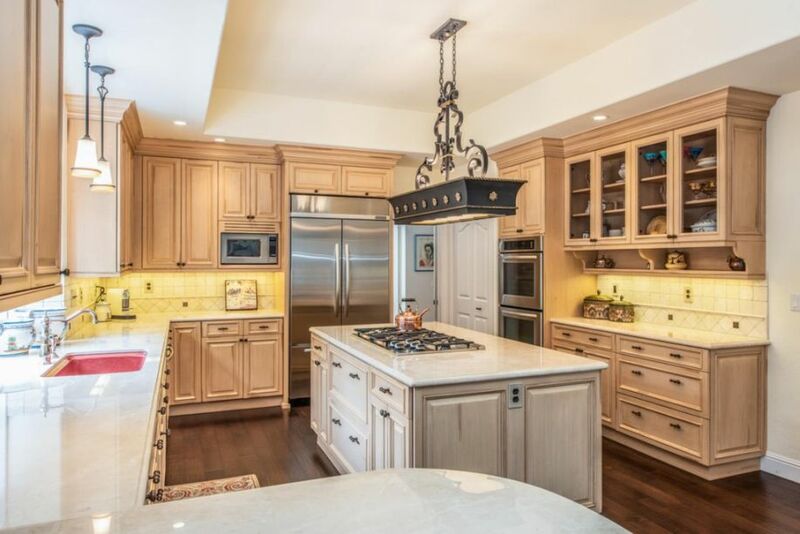 They chose a lovely wood stain for the cabinets that ties in with the beams but does not match perfectly, and the kitchen paint colors accent both features while still providing enough contrast to make them stand out. I love simplistic kitchen color schemes like this one because it allows each decorative finish that you choose stand out beautifully. If this designer had used bright kitchen colour ideas and a lot of wall decor you would lose the appeal of the gorgeous cherry cabinetry and awesome modern backsplash. 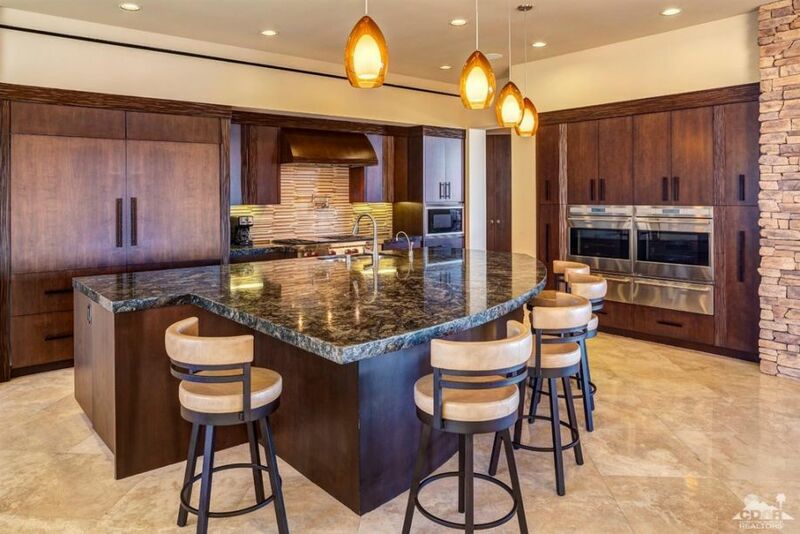 The soft warm tan paint is the perfect accent to the architectural detailing of the exposed stone wall, polished floors and cool lines of the cabinetry and center island. The color palette evokes a very modern kitchen design and sets the tone for the rest of the attached living area. Overall, I think it is a great look and is actually quite complex despite its deceptive simplicity. 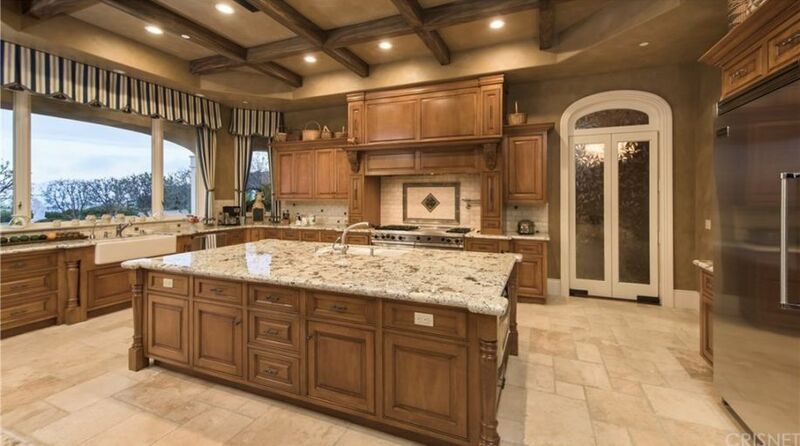 Kitchen color schemes are the foundation of a design that can have a strong impact on the overall look. The most important place to establish this scheme is of course in the kitchen cabinet paint colors. This element has by far the most surface area of the room and as such is a key part in the design. When I am selecting the finish, I always consider the overall size of the space. If you are working with a small kitchen, I always suggest going with something lighter like this home in order to make the space seem bright and open. Dark colors work fine in larger kitchens, but I tend to avoid them in smaller rooms because they can quickly overpower a space. If you keep this basic rules in mind when you are painting kitchen cabinets, you will always generate a successful design. I thought that these were such unique kitchen color schemes that I just had to share. I really like the rustic minimalistic approach that this designer took both with the kitchen wall colors as well as the rest of the furnishings. The focal point of the space is certainly the gorgeous exposed beam ceiling that really sets that outdoorsy campsite tone. 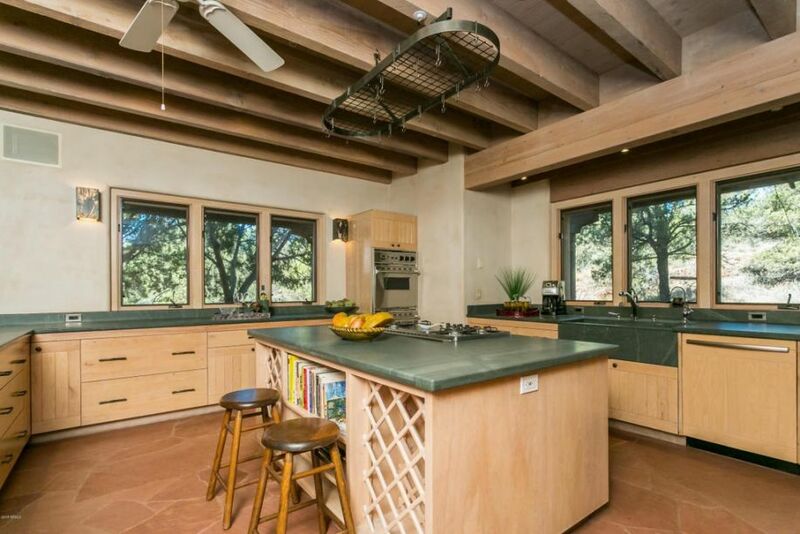 I love how they paired it with simple white washed cabinetry that mirrors the wood on the ceiling as well as very cool deep green granite countertops that bring in the shades of the trees outside. I have never seen granite colors like this used in a kitchen, but I think that it provides just the right amount of design to this minimalistic approach to decor.